Meatloaf Hamburger Patties are individually sized mini-meatloaves cooked on the stovetop instead of in the oven! 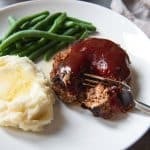 Topped with a tangy, sweet brown sugar ketchup glaze, this may be an old-fashioned recipe but the classic comfort food flavors will never go out of style. In a large bowl, combine all of the meatloaf ingredients and mix together by hand. Shape into 4-5 individual patties. Make the topping by combining 1/3 cup ketchup and the brown sugar in a small bowl and stirring until smooth. Heat a large cast iron skillet over medium heat then add a little oil to it. When the oil is hot, carefully place each hamburger patty into the skillet and cook for about 5-7 minutes until nicely browned on the bottom, then flip to cook the other side. Immediately top each hamburger patty with some of the brown sugar ketchup topping while the patties cook for another 5 minutes on the other side. When the meatloaf patties are no longer pink in the center, remove from the skillet and let rest for 5 minutes so the juices can redisurse. Serve with mashed potatoes and green beans, or on hamburger buns for a meatloaf sandwich. *If you don't have saltine crackers on hand, you could substitute an equal amount of bread crumbs or oats (quick or old-fashioned would both work) that have been pulsed in a blender or food processor a few times. Alternatively, you could bake the meatloaf patties on a lightly greased baking sheet at 375 degrees F for 20 minutes or until cooked through.